A Factory Pattern or Factory Method Pattern says that just define an interface or abstract class for creating an object but let the subclasses decide which class to instantiate. In other words, subclasses are responsible to create the instance of the class. 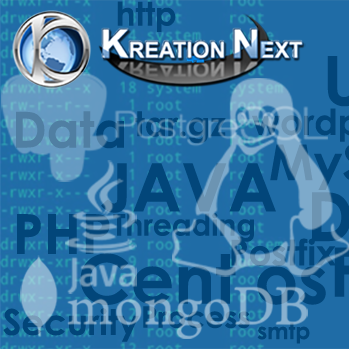 The Factory Method Pattern is also known as Virtual Constructor. Factory Method Pattern allows the sub-classes to choose the type of objects to create. It promotes the loose-coupling by eliminating the need to bind application-specific classes into the code. That means the code interacts solely with the resultant interface or abstract class, so that it will work with any classes that implement that interface or that extends that abstract class. When a class wants that its sub-classes specify the objects to be created. When the parent classes choose the creation of objects to its sub-classes. We are going to create a Plan abstract class and concrete classes that extends the Plan abstract class. A factory class GetPlanFactory is defined as a next step. GenerateBill class will use GetPlanFactory to get a Plan object. It will pass information (DOMESTICPLAN / COMMERCIALPLAN / INSTITUTIONALPLAN) to GetPalnFactory to get the type of object it needs. Step 1: Create a Plan abstract class. Step 2: Create the concrete classes that extends Plan abstract class. Step 3: Create a GetPlanFactory to generate object of concrete classes based on given information.. 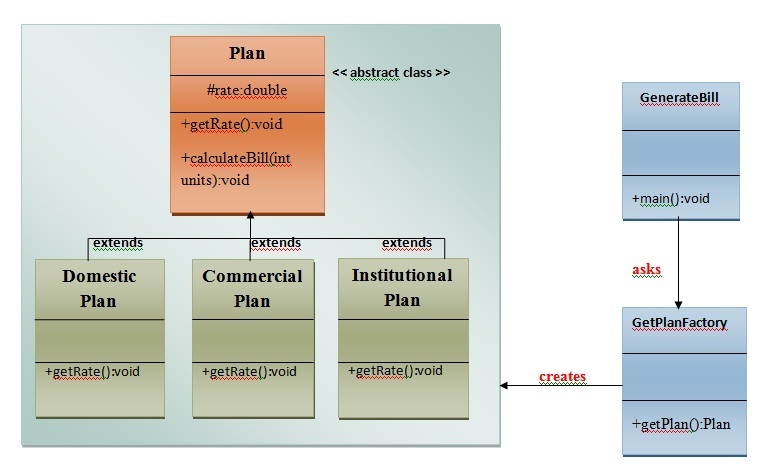 Step 4: Generate Bill by using the GetPlanFactory to get the object of concrete classes by passing an information such as type of plan DOMESTICPLAN or COMMERCIALPLAN or INSTITUTIONALPLAN. 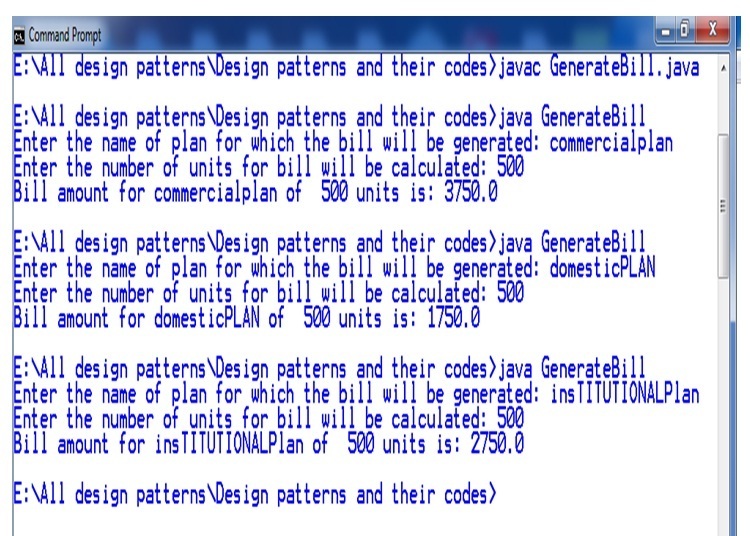 //call getRate() method and calculateBill()method of DomesticPaln.